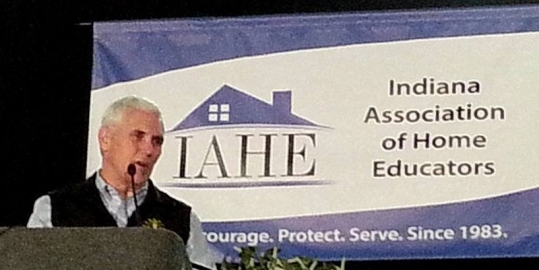 Governor Mike Pence was greeted by Indiana Homeschoolers with a standing ovation. It has been several years since I last spoke at my state’s homeschool convention. I got to end that “dry streak” this past weekend. The convention was very well attended, and it ran incredibly smoothly. 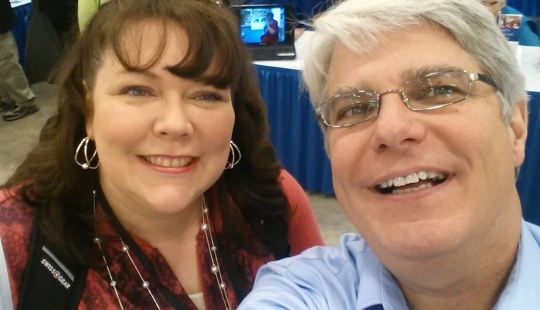 I gave a total of six talks at the convention, and two of them were with Diana Waring. Diana and I spoke about Homeschooling: The Environment for Genius and Textbook Myths and How to Deal with Them. The four “solo” talks I gave were: ‘Teaching’ Jr. High and High School Science at Home, Teaching Critical Thinking, How are Homeschool Graduates Doing?, and Vaccines: The REAL Story. As I understand it, audio recordings of all these talks will eventually be available through Resounding Voice. The vaccine talk is rather controversial in some homeschooling circles. I take a scientific approach to the issue, of course, which means I recognize that for the vast majority of people, vaccines are both very safe and very effective. As a result, I encourage people to vaccinate their children. In the homeschooling community, there is a small-but-strong anti-vaccination movement, however, so I was surprised that the convention asked me to give the talk. They did get some angry e-mails about it, but in the end, it went well, and even though I specifically asked for hostile questions, there were none. All the questions I got were very serious and very polite. It was really fun to have her mixed in with all the homeschooling students who have used my courses over the years. The other big surprise followed the first talk I gave with Diana Waring. It was the Saturday morning general session, so there were a couple of thousand people in the audience, and after our talk, Governor Mike Pence took the stage to say a few words to the crowd. From the time I first met him and campaigned for him when he ran for Congress, I have deeply admired him. He is one of the few politicians who I would call true statesman. The vast majority of the attendees must have agreed with me, because he was greeted with a standing ovation. He ended his talk by asking the homeschooled students in the audience to give a standing ovation to their parents for their hard work and courageous choice to homeschool them. It was a very powerful moment. In the sessions where I spoke, there were a lot of excellent questions. I want to highlight two of them. In our second talk, Diana Waring and I discussed the various myths you find in textbooks, such as the nonsensical idea that ancient people thought the earth was flat. After that talk, someone asked about a book called A Child’s History of the World by Virgil M. Hillyer. I was not familiar with it, but as a historian, Diana was. Apparently, it has some racist chapters at the beginning, but if you get past those chapters, it is an entertaining and informative book. Well, some publishers have taken to publishing it without those racist chapters at the beginning, and the parent asking the question wondered what we thought of that. Diana and I essentially agreed that if there is good material in a book, it is probably worth republishing, and it also makes sense to take the bad material out. However, both of us agreed that if you do that, there should be a very prominent statement to that effect. I suggested saying something like, “The first few chapters of this book have been removed because many of the statements made in them are known to be incorrect.” That way, the reader understands that the original version of the book contained some serious flaws. The other question I want to mention came from my vaccine talk. One parent asked me what is causing the alarming rise in autism cases. I told her that some have tried to claim that autism is not on the rise. Instead, changing diagnosis criteria are mostly to blame for what seems to be a rise in autism. I told her I disagree with that. I also indicated that we probably don’t have all the answers, but we know one thing for certain: The rising age of parents is at least partly to blame. There have been several studies that indicate that the older the parents are (particularly the father), the more likely the child is to have autism. Genetic studies back that up. While that might not explain all of the increase we see in autism cases, it explains at least some of it. I thoroughly enjoyed my time at the Indiana Association of Home Educators convention, and I hope I get to speak there again soon! Jay, I enjoyed the couple of sessions that I attended that you led this weekend. One comment on the autism question (my experience is not on the scientific side, but on being the parent of a child on the spectrum). On one hand, I certainly think that there is some inflation of the autism numbers based on criteria. There are children I run into all the time that have an autism diagnosis that would NEVER have been diagnosed as being on the spectrum when I was a child. This cannot be ignored. However, there is clearly also a significant rise in occurrence of autism symptoms in recent years. 1. Differing ways of looking at the population can change the occurrence rate. 2. There might be multiple sources or causes of autism, not a single source. 3. Autism itself may really be many disorders that share some common symptoms. This causes problems: scientifically we are looking for a single thing that has “caused the increase in autism”–but we will never find this. We also end up looking for the silver bullet that will “cure” autism. This won’t happen either. If I were to guess, I expect that we will find genetic contributions and environmental contributions. But most importantly, the challenge with autism is the formation of certain neural pathways, and the hope is that we will uncover more effective therapies that will allow those on the spectrum to develop a more integrated mind. Thanks for your excellent points, Joel! Dr. Wile, we are studying about Columbus right now, and several of our books mention that even though many educated people of that time period believed the earth was round, tons of other regular folks (like the sailors on board his ship) still thought the earth was flat. This seems reasonable, since there is quite a range of scientific understanding among the population today, too! Thanks for your comment, Suzanne. There is simply no evidence to support the idea that “tons of other regular folks” believed the earth was flat. It could be, but since there is no evidence, I would assume that the “regular folk” took the word of the “educated folk,” especially since the “regular folk” listened to the religious leaders, and the religious leaders all agreed that the earth is a sphere. In fact, we know that even uneducated sailors understood that the earth is a sphere. In fact, if you use the excellent book by a certain Dr Jay Wile, you will learn that the ancients not only knew that the world was round, but also how large it was. The sailors were probably more concerned about the rough seas or the possibility of running out of food before reaching their destination! The myth about ‘flat earthers’ was created by a 19th century author, and is bolstered by what C S Lewis calls our ‘chronological arrogance’, thinking that ancient cultures were ignorant and uncivilised, especially the brown-skinnned peoples. See, ‘Science in the Ancient World’ strikes again!